Tasty salmon fish congee, top with crispy fish skin and crunchy lettuce. It’s a perfect light meal all year round. Had you lived in Hong Kong for a while, you would’ve known a very popular hand-made fish ball congee. 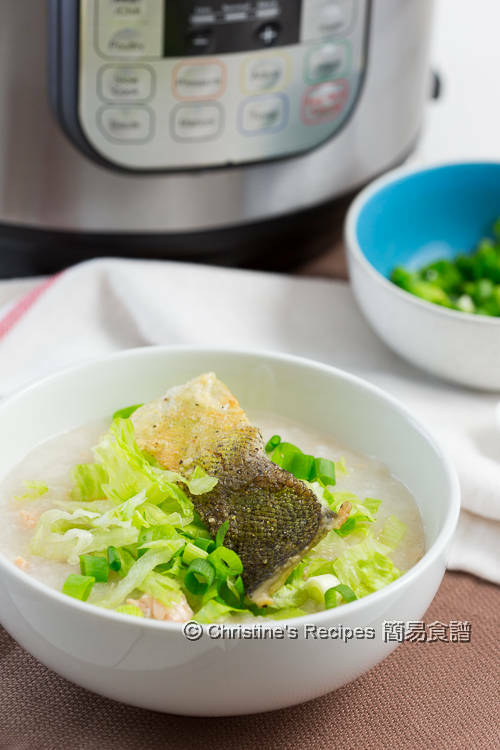 The congee dish is made with a kind of fish that is not easily found in Australia. 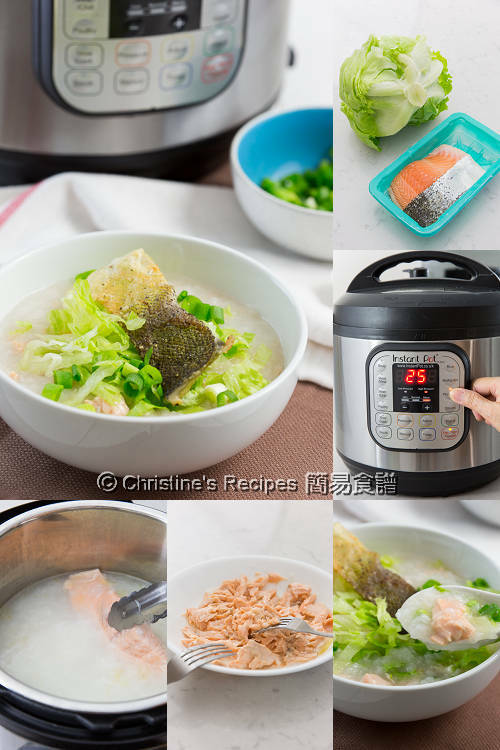 To ease my craving for fish congee, I tried with salmon, skipping the making-fish-ball part, but keeping the fresh, crisp lettuce as the traditional congee often used. Our family was so impressed with the taste and I love this cheater’s method saving lots of time and effort. Simply put in the boned, skinned salmon fillets into the congee. After boiling for a few minutes, drain them up and tear apart the fish meat with folks. 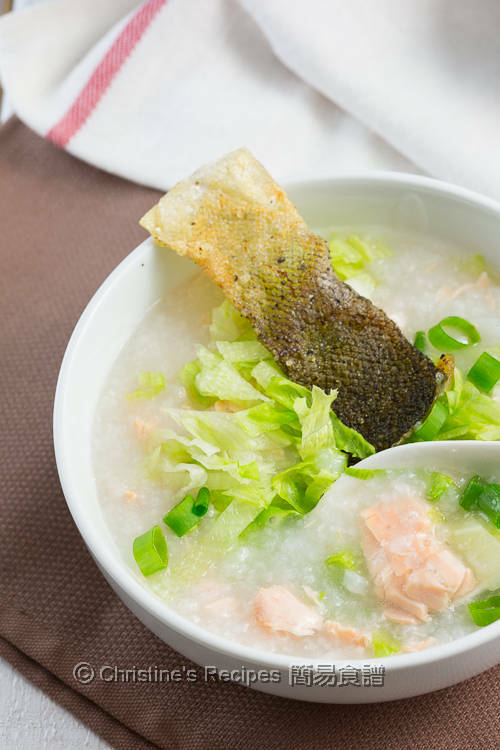 Toss the salmon meat back into the congee. Top it up with some shredded crisp lettuce. There you go. The family enjoyed the salmon congee so much. Did I mention the crispy salmon skin that’s pan-fried going so perfectly with the congee? Rinse rice and drain well. Mix with salt and oil. Set aside for 15 minutes. Carefully remove any bones from the salmon fillets if any. Skin them. Don’t discard the skin. Use kitchen towels to absorb any moist. Season with salt and pepper. Pan-fry over medium-high heat until they turn crispy. Transfer on kitchen towels to absorb excess oil. Set aside. Prepare Instant Pot. Put in water, rice and ginger. Cover the lid, turn the steam release handle to the “sealing” position. Select “porridge”, high pressure cooking for 25 minutes. Natural release. Wait until the float valve drops to the down position. Remove the lid. Select “saute” and“more. Add salmon and cook for 8 minutes. Drain up the salmon. Use two forks to shred the salmon. Toss back into Instant Pot. Mix well. Cook to preferred consistency. Test taste. Season with salt if necessary. Ladle congee into serving bowls. Add lettuce on top. Garnish with spring onion and crispy salmon skin. Serve immediate. Prepare a large pot. Put in 2 ½ liters of water and rice. Bring it to boil over medium-high heat. Reduce heat and simmer for 2 to 2½ hours. When the congee is almost done, about 8 minutes towards the end of cooking, add salmon fillets. Drain up the salmon. Use two forks to shred the salmon meat. Toss back into the pot. Cook to preferred consistency. Season with salt if needed. Pay close attention while cooking congee on stove, as you don’t want it spill over or stick to the bottom. 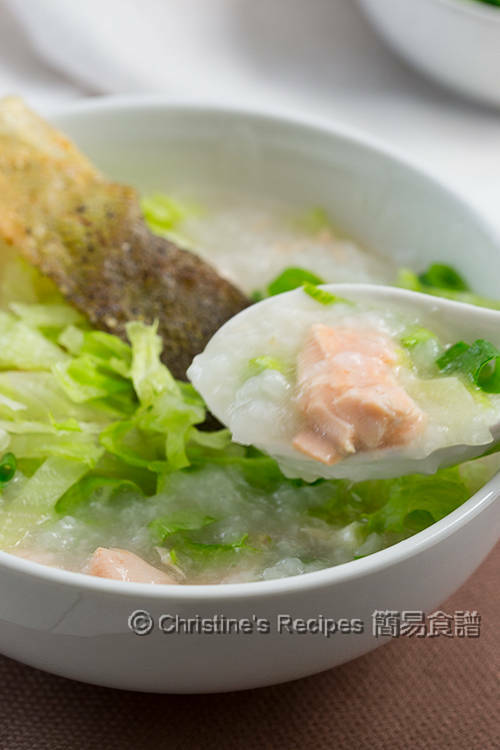 Make sure the bones inside salmon fillets are removed before putting them into the congee to cook. Pat salmon skin as dry as you can with kitchen towels. The salmon skin will become crispy after pan-frying. So very delicious and warming! Salmon is my favourite fish.